More than 21 armed herdsmen have killed by troops of the Military Operation code named Operation Whirl Stroke, OPWS along the Gbajimba-Akor-Tomata axis of Guma Local Government area of Benue State in the last three weeks. Force Commander of the operation, Maj. Gen. Adeyemi Yekini who disclosed this yesterday, noted the armed herdsmen were among a group of 20 armed herdsmen who were riding on motorcycles and moving along the Guma axis towards Nasarawa State. The herdsmen had last Saturday, engaged in an exchange of gun fight for about two hours with troops of the OPWS in Guma during which one soldier was killed and two others injured. Speaking during a press conference yesterday, held at the Tactical Air Command, Makurdi, Maj. Gen. Yekini who said the number of casualties among the herdsmen during the initial encounter could not be ascertained, noted that while the fighting was going on that day, an Mi35 helicopter that was deployed to provide air support for the troops sighted the armed herdsmen on motorcycles. “During the fire fight, the Mi35 spotted a group of about 20 armed herdsmen riding on motorcycles moving along the axis towards Nasarawa State. 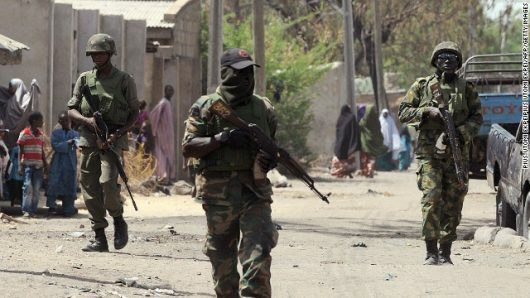 15 of the armed herdsmen on five motorcycles were neutralized with rocket fire from the Mi35 while others escaped with varying degrees of injury. “Our troops chased the remaining herdsmen until contact was broken close to the boundary between Nasarawa and Benue State. Plans are in progress to conduct further clearance operations of the border areas between the two states,” Yekini said. He further disclosed that another operation was conducted in response to the recent killings around Katsina-Ala town suspected to have been masterminded by wanted militia leader, Terwase Akwaza alias Gana. “The raid operation which took place at Tse Akwaza camp belonging to Gana in Kastina-Ala commenced at about 0500hours on 18th August, 2018 through JatoAka-Kashimbila-Tyotsar axis but was suspended due to bad terrain and damaged bridge at Tyotsar which troops could not cross due to flooding. The Force Commander said the troops however returned to the target area through an alternative route with assault on the camp preceded by an air strike which neutralized key buildings in the area after which troops moved in for mop up exercise. “It was not clear if Gana was killed during the assault but trails of blood seen in the building suspected to be where he slept suggests he might have been hit. A motorcycle usually use by Gana was also badly damaged during the air strike. While maintaining that efforts were ongoing to confirm if Gana was killed in the attack, Yekini vowed that the troops would still go after him if it is certain that he is still alive. While disclosing that troops have been able to recover seven automatic weapons from armed militia men in the last six weeks, the Force Commander said the modest achievement of the OPWS resulted in the gradual return of about 135,000 internally displaced persons (IDPs) to their homes and farmlands across Benue and Nasarawa States “ So far 40 automatic weapons, 1,100 rounds of ammunitions and 60 suspects have been arrested and handled over to security agencies in the various states for prosecution,” Maj. Yekini intimated.